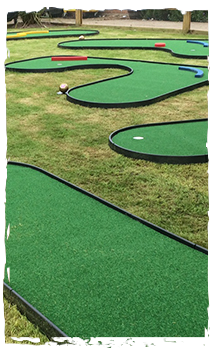 HM Adventure Golf also design and supply of the most cost effective and attractive mini golf courses available in the UK. Our CFG modular course are imported from the leading supplier in the USA we now stock courses for immediate delivery. HM Adventure are the sole distributor of this system in the UK. Fun for all ages, our courses are totally flexible and suitable for indoor and outdoor use at leisure venues, golf clubs, schools, parks, holiday villages, driving ranges, hotels, camping and caravan sites, farm parks, soft play centres, garden centres, shoppin g centres and business premises. They would also make an interesting and fun addition to any garden. We are able to offer "off the shelf" 9 hole courses, as shown below, which can be loose laid on any flat surface indoors or outdoors. Easily installed in a couple of hours, the course can be left set up all year round, alternatively it is ideally suited for setting up seasonally or transporting for portable use. The course breaks down i nto easy to handle sections for moving and storage.